Fritz Hahn: "The Baumkuchen Family"
Fritz Hahn of Heidelberg is the one published Baumkuchen historian, to the best of my knowlege. He published a couple of treatises on the evolution of rotisserie cakes; I don't agree with everything in them, but I want to share them here. Here's my translation and commentary for his article Die Familie der Baumkuchen, originally published simultaneously in Die Konditorei and Der Konditormeister, July 1964. There are certain products that are the mark of a good pastry shop, but marzipan and chocolate are the only ones for which there is detailed historical research. The insightful story of Baumkuchen, King of Cake, has not yet been told. It shows clearly how cultures are intertwined and interdependent, even separated by distance and time. It is therefore the job of this presentation to share some treasures from the Baumkuchen Archive and introduce this pastry’s colorful evolution. 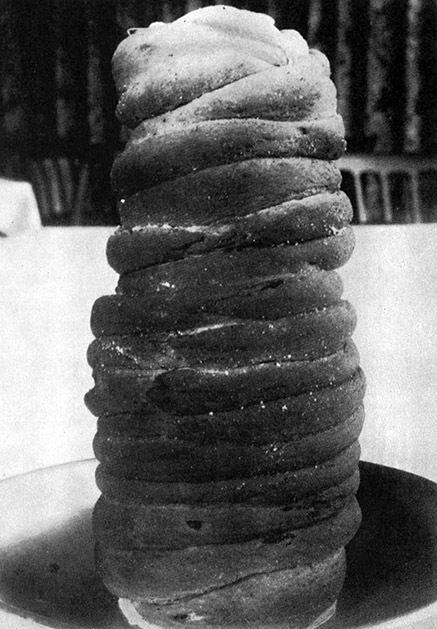 In Austria the text of the Codex Alimentarius Austriacus (1931 2nd edition, Issue XXVII, p 35, 37) is used: “Baumkuchen consists of batter that is baked on a cylinder over an open fire.” It clearly follows that the Baumkuchen family is special for its baking method, which distinguishes it from all other pastries. Words and etymology. The question of how something gets its name can usually be answered by etymological texts. But for the word Baumkuchen, all the existing literature failed. The data from the lexicons were inaccurate and incorrect, if there was any at all. As stated previously, tree cakes are baked on a baking roller near open flame. This food preparation method stretches back to the very beginnings of human culture: the spit-roast. Originally, the spit was made exclusively of wood. So a large number of the 74 previously known names for related pastries start with Spieß (stick), Prügel (big stick), and Baum (tree). The first appearance of the name Baumkuchen can be found in the Elsholtz Diæteticon, 1682, as “Baum-Kuchen.” By comparing this to other pastries’ names of the same era, we can clearly see the cake was so named because it was baked on a piece of a tree. 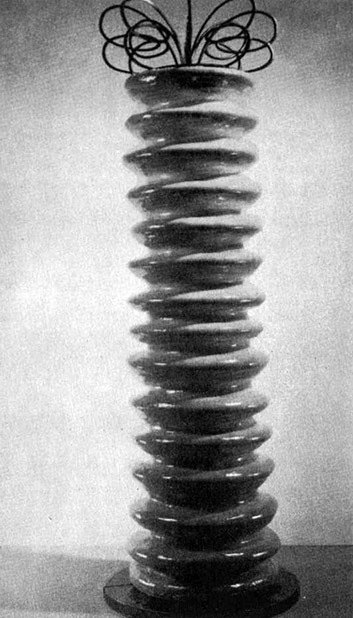 The style of modern Baumkuchen, with layers made from batter, was not known at the time. Thus, this feature was not relevant in the naming. The French and English names for Baumkuchen also derive from the rotisserie spit. French names: gâteau de broche (“cake from the spit"), gâteau à la broche arbreux (“cake from the wooden spit”), gâteau broche (“spit cake”). UK name: Spit-Cake. Just for completeness I will note that, in both the French and English vernacular, these names are rather unappetizing. Development. As we see in the terminology and etymology, it is clear that this pastry family began as baked goods prepared on a spit over an open fire. But unfortunately, we cannot identify the actual time or place where a cake of this style was first baked. Modern man is inclined to seek an “inventor” that can be credited, but cultural history teaches us that almost everything has developed gradually from modest beginnings. The interrelations of the various forms of rotisserie cakes through time and space means we must further classify the cakes by certain features. By comparing historical recipes and documents, five generations of Baumkuchen development appear. It is only after many centuries that mention of this bread resurfaces: 1466, in the legal proceedings of the town of Daun, Vulkaneifel, Germany. 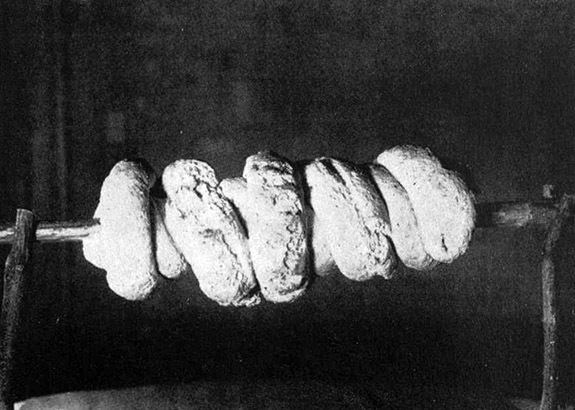 For the hunting master a spißlaib (“spit-loaf”) was assured: “...and the spißlaib leftovers should provide bread in the morning for a servant and a dog, thus it should be cut to above-the-knee length.” Such a loaf must have been 65-70 cm long. In Teutsche Speißkammer by Hieronymus Bock (1550), a bread named “foraceus panis” is mentioned as well. These references indicate that the bread was a sort of emergency bread, baked on “war marches,” eschewing bakeware and ovens. An engraving of chef Bartholomeo Scappi, head cook to Pope Pius V, clearly shows one such bread on a spit near the hearth. Even in the last century, this bread has been baked sporadically; the poet Gwen Bristow attests of it in California. On long treks, loaves would be wrapped around iron rods, baked over burning buffalo dung alongside meat or coffee. Sometimes the ramrods of rifles were used as a baking spit. Knowledge of this baking method was likely carried by Franciscan missionaries, who had, since 1823, set up missions on the western coast of California, at intervals of a day’s travel. Generation II. Although for much of history it was difficult to pin down the distinction between “bread” and “cake,” the second generation of the Baumkuchen family can be unequivocally labelled “cake.” In one of the Heidelberg University manuscripts, among the many exquisite recipes we find: “About making a cake on a spit. If you want to make a cake on a spit from heathen dough, prepare it well in two or three colors and lay them in parallel, so each won't touch the other, and cut then the one part with a knife in one place, and wind that around a wooden spit and anoint it with egg yolks at intervals, so it will stay whole, and fry it not too hot.” The aforementioned dough, which was named “Heathen dough” or “Bohemian cake,” is from the Würzburg parchment manuscript, written approximately 100 years earlier. Modifications include adding honey, eggs, pepper, “spices” and almonds to the dough. Colored dough was very popular at the time, and instructions were written for various colorations: saffron for yellow, spinach juice for green, cornflower juice for blue, and several others. This dough would then be wound onto a wooden post, brushed with egg yolk and fried “not too hot.” Cooking such a cake is better described as “frying,” rather than “baking,” as my modern experiments on these recipes show. From the monastery kitchens where these cookbooks first appeared, the recipe soon spread to the Lords’ and civilians’ kitchens. Past 1500, mentions of “spieß kuchen” grow more numerous and the seasonings more varied. Saffron is often mentioned, as is mace and, later, cinnamon. But two ingredients, dried brewer’s yeast and currants, were universally required, strewn throughout the dough. This generation of rotisserie cake became quite widespread. In the Italian Epulario (Venice, 1526), there is an engraving showing how such a cake was baked. A woman turns the spit while a cook uses a goose feather to brush the surface of the cake with fat. In Joachimsthal (Bohemia), spit cakes even raised the ire of the church. The great preacher Mathesius, a friend of Martin Luther, wrote the following in his posthumous work Syrach (1554): “As the men go out the front, the women go out back to the Krahles, for weeks, eating spit cakes and guzzling beer.” In what was then the third largest city in Germany, therefore, the women of the silver miners were all week in the tavern, enjoying cake and beer (!). What else from the 308 Sermons, written in 1554, could be just as true in 1964! 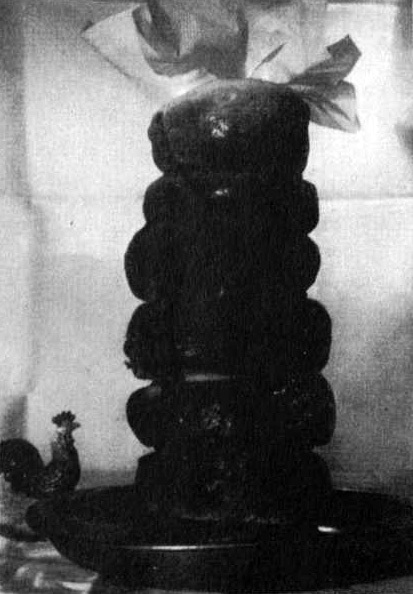 These second-generation Baumkuchen existed until the beginning of this century in Austria, and refined versions are seen in Hungary as “Kürtös kalacs” and in Transylvania as “Baumstritzel” or “Schornstein-Kolatschen,” serving as traditional wedding cakes. Generation IV. Thus far, only dough-based spit cakes are attested in the historical record. This changed after the 30 Years War. During this period of upheaval, the lavish illuminated cookbooks and baking manuals passed into the hands of women at home and abroad. In addition, the spoils of war in Turkey introduced coffee to the masses, and its consumption became a key component of art and culture. 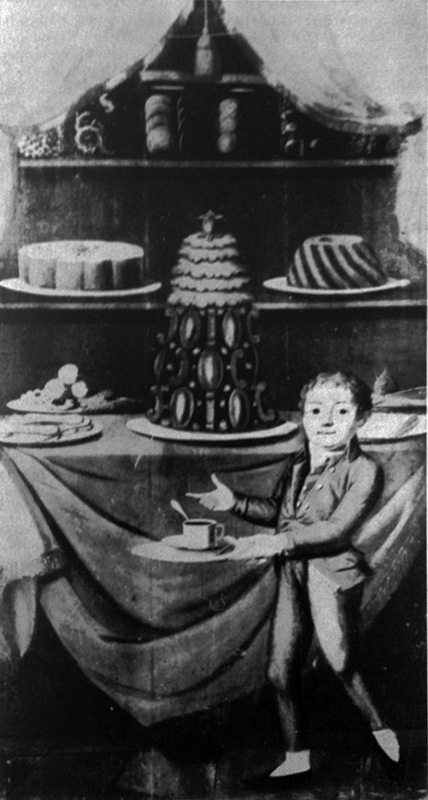 The variety of fine pastries was faithfully documented by Maria Sophia Schellhammer, a professor’s wife living in Kiel. 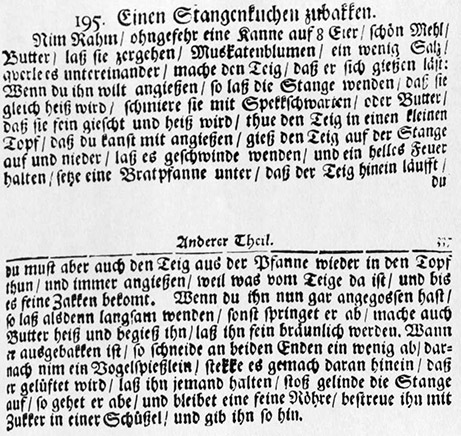 Her cookbook, published in 1692 under the title Die wol unterwiesene Köchinn (“A well-informed kitchen”) and later in Berlin as Brandenburgischen Kochbuch, contains four recipes representing three generations of the Baumkuchen Family. There is one Generation II recipe, one Generation III recipe, and two Generation IV recipes. For the latter two, the batter is prepared like regular contemporary pancake batter. The baking studies for these recipes were particularly enlightening. The results suggest that it was not easy at all to achieve the cake’s iconic “branches.” However, the cake’s flavor was excellent, and it was surprisingly moist. This cake style must have been widespread, even before 1700. Many recipes have been found. It is thoroughly described in many regions, with the most diversity found in cookbooks published in Nuremberg after 1700. Conrad Hagger, head cook to the Prince-Bishop of Salzburg, shares five recipes and an illustration. As time goes on, stronger spices are added to the recipes, and even ground hazelnuts. To make branches more easily, the cakes were garnished during baking with slivered almonds or candied citrus peel. 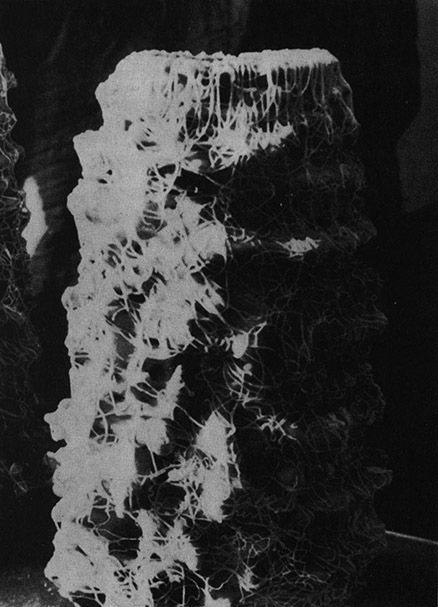 After baking, there are often instructions for an “Eyß,” a glaze of fine sugar, egg white, and bitter orange blossom water, “dabbed” upon the branches of the cake. We find directions that recommend, after setting the Baumkuchen on display, placing a bouquet of fresh flowers in the hole, and small pastries “delicately” scattered on the table. Many of the Generation IV recipes say to separate the eggs, stirring the yolks into the cream and beating the egg whites until stiff before adding them to the batter. This achieves a much higher quality batter for baking, but the relatively high cream content prevented the tender cake texture that we achieve today. Generation V. The exact transition from Generation IV to V is not clear. It was not until the mid-18th century, with the expansion of overseas trade, that further pastry improvements were possible. For the first time, sugar was cheap and plentiful, and accessible to more sectors of the population. It is hard to imagine how much this changed the way bakeries and kitchens treated sugar, the “white wealth.” Bakers could experiment with sugar, in secret, whispered and trusted only to one’s closest friends: “stir the eggs and sugar for an entire hour, but for heaven’s sake, only stir it in one direction, else it will fail!” The baking developments must have happened in this (or a similar) way, after it was discovered that sugar and eggs, as well as butter and sugar, could be combined to make never-before-seen luxurious batters. The expert knowledge led to batters that baked completely differently than those previously known; they baked rapidly and produced much, much more delicate cakes. For decades, however, no Baumkuchen recipes were printed that used this new knowledge. The first Generation V recipe is found in 1769, in the 7th edition of Marcus Looft’s Niedersächsischen Kochbuches, alongside two Generation IV recipes. But more soon followed; similar recipes were published in Berlin, 1774, in two different texts. By 1796 this type of Baumkuchen recipe was present in Ulm, and in Thuringia soon afterwards. The historical record is very instructive, permitting us to track recipes and watch the progressive refinements. However, beyond this time there is a huge increase in the number of recipes and variations, too many to trace where each variant originates. Looking back at the evolution and spread we see, once again, the astonishing way in which the Baumkuchen family spread: from Greece, to Rome, to the southernmost edge of the Limes Germanicus, then up the Danube, and spreading fan-like through the German-speaking lands, all while the pastry improves in quality. Now, the question on everyone’s minds must be the history of professionals baking and selling rotisserie cakes. The Generation II Baumkuchen already raised the ire of some, as a 1485 Nuremberg police ordinance proves. 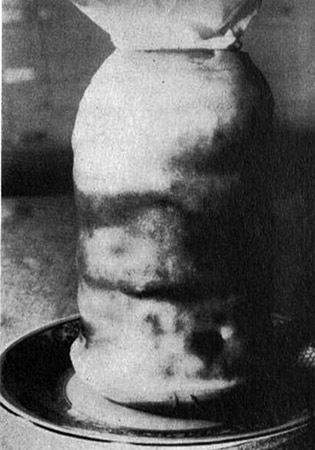 It restricted the number of merchants who could sell “Ayrkuchen” (chimney cakes). In Frankfurt (Main), meanwhile, this cake was featured in the afternoon of the first day of a patricians’ community wedding party. It was “adorned with beautiful flowers and plants made of wax.” Each of the invited guests received a piece of cake to bring home to their children. A wedding custom we can still relate to! This custom was also familiar to the indulgent patricians of Hagen-Hohenlimburg; the law abolished this “personal expense” in 1576. 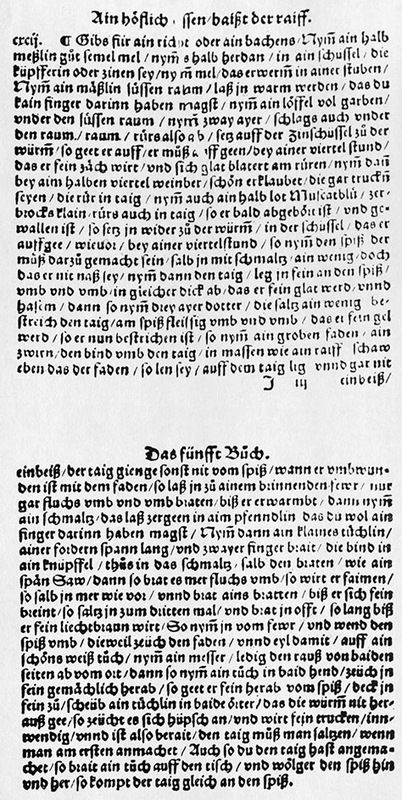 From an account of the 1525 Fasnacht, we know that an “Eyerkuchen” was delivered to a society meeting; 7 pieces costing 3 Groschen, 5 Pfennig (silver money). NOTE: I haven't translated the rest of the article! It didn't seem very interesting to me. Von den zahlreichen Erzeugnissen, welche das Gesicht einer guten Konditorei bestimmen, wurden bisher außer der Schokolade nur dem Marzipan ausführliche fachsgeschichtliche Forschungsarbeiten gewidmet. Dem König aller Kuchen, dem Baumkuchen, fehlte bisher eine Würdigung seiner aufschlußreichen Geschichte, welche uns deutlich erkennen läßt, wie eng Zeiten und Völker kulturell miteinander verflochten und voneinander abhängig sind. Es soll daher Aufgabe dieser Darstellung sein, einige der Schätze aus dem Baumkuchenarchiv auszubreiten und mit Hilfe dieser Beweisstücke die bunte Entwicklungsgeschichte darzustellen. In Österreich gilt der Text des Codex Alimentarius Austriacus (2. Aufl. 1931 Heft XXVII, S. 35,7): „Baumkuchen bestehen aus Teigmassen, die auf einer Walze über offenem Feuer gebacken werden.“ Daraus ergibt sich eindeutig die Sonderstellung der Baumkuchenfamilie in der Verfahrenstechnik, die allein damit von allen anderen üblichen Gebäcken deutlich unterschieden ist. Wort und Sache. Die Frage, wie eine Sache zu ihrem Namen gekommen ist, findet sich in vielen Fällen in den Wörterbüchern der Etymologie beantwortet. Bezüglich des Baumkuchens versagte aber alle erreichbare Spezial-Literatur. Die Auskünfte der Lexica waren, wenn überhaupt vorhanden, ungenau und unzutreffend. Das erste Auftreten des Namens „Baumkuchen“ findet sich bei Elsholtz-Diaeteticon 1682 in der Form „Baum-Kuchen“. Der Vergleich mit anderen Gebäckbezeichnungen im gleichen Werk läßt eindeutig erkennen, daß der Kuchen so genannt wurde, weil das Backen an einem „Baum“ erfolgte. Die beim heutigen Baumkuchen übliche, jahresringähnliche Schichtung war zu dieser Zeit ebensowenig bekannt wie die Zakkenbildung. Diese beiden Merkmale scheiden also bei der Namensgebung aus. Von den verschiedenen Namen für Baumkuchen in der französischen und englischen Sprache beziehen sich ebenfalls einige auf das urtümliche Backgerät, den Spieß. Frankreich: Gâteau de broche – Kuchen vom Bratspieß, Gâteau arbreux à la broche – Kuchen vom hölzernen Bratspieß, Gâteau à la broche. Großbritannien: Spit-Cake – Bratspießkuchen. Nur der Vollständigkeit halber sei angeführt, daß in beiden Ländern der Volksmund dem Baumkuchen einen überaus unfreundlichen Namen gegeben hat. Entwicklung. Nachdem Begriff, Wort und Sache eindeutig erkannt waren, zeigte sich fast von selbst der Weg auf, der in die Nähe des Ursprungs dieser am Spieß am offenen Feuer hergestellten Gebäckfamilie führte. Aber leider nur bis in die Nähe des Ursprungs, denn die tatsächliche Wurzel dieser Spezialität wird sich weder zeitlich noch örtlich genau ermitteln lassen. Wohl ist der heutige Mensch geneigt, allen Ursprung einer Sache einer „Erfindung“ zuzuschreiben, doch lehrt uns die Kulturgeschichte, daß sich wohl fast alles aus bescheidensten Anfängen heraus entwickelt hat. Die Verflechtung der verschiedenen Entstehungsformen bei Baumkuchen über Zeit und Raum zwingt zur Aufgliederung nach der Art der Herstellungsweise. Aus dem Vergleich der gefundenen Rezepturen und Mitteilungen miteinander zeichnen sich für die Entwicklung des Baumkuchens die Generationen I bis V ab. I. Die ursprüngliche und älteste Form derartiger Gebäcke tritt uns mit dem im antiken Griechenland bekannten οβελιας (obelias, obelites) entgegen. Es war dies ein aus Weizenschrotteig bereitetes Brot, welches zu Strängen ausgeformt auf hölzerne Stangen aufgewickelt, am offenen Feuer gebacken und dann von den οβελιφοποι (obeliaphoren) auf den Schultern in den Festzügen des Dionysos mitgetragen wurde. In zahlreichen Stellen der altgriechischen Literatur wird dieses erwähnt. Es wird sogar mitgeteilt, daß diese οβελιας aus einer Menge von 1—3 talantes Mehl (26 bis 78 kg) erbacken wurden. Bereits Sokrates († 399 v. Chr.) wußte den Ursprung dieser Kultgebäcke nicht mehr anzugeben und teilt nur mit, daß diese „von Dionysos auf seinen Feldzügen erfunden worden wären“. Die griechischen Wein- und Fruchtbarkeitsfeste wurden später, zusammen mit anderem Kulturgut, von den Römern übernommen, und fanden dort in dem Kult der Bacchusfeste ihren Niederschlag. In der Literatur findet sich wiederholt die Mitteilung, daß „obelias“ dem Bacchus geweiht waren. Der griechische Name wurde ins Lateinische übernommen. Wohl wurde bereits v. Chr. gegen den Umfang der Bacchusfeste behördlich vorgegangen, aber die Römer haben sich doch nicht von ihrem Kult abbringen lassen. Als die römischen Heere nach Norden vordrangen, nahmen sie zugleich mit dem Weinstock auch die dazugehörigen Kultgebäcke mit Im bereich des Limes finden sich in der Folgezeit einige, wenn auch spärliche Mitteilungen über „obelias“. Vom südlichsten Teil des römischen Grenzwalls berichtet List in seinem historischen Roman „Carnuntum“ anläßlich des Weihnachtsfestes von einem „Prügelkrapfen von dem Umfang eines starken Mannes und fast der Höhe eines solchen“. Erst nach vielen Jahrhunderten, 1466, findet sich im „Weistum“ von Daun (Eifel) wieder eine Nachricht über diese seltene Gebäckart. Darin wurde dem Jagdherrn ein spißlaib verbrieft: „...vnd sond och die spißlaib also sin, daß airn ainen soll setzen vff den risten vnd sol ainem knecht vnd ainem hund ain morgenbrott oberhalb dem kun (Knie) abschniden.“ Demnach muß ein solcher spißlaib 65 bis 70 cm lang gewesen sein. In der „Teütschen Speißkammer“ von Hieronymus Bock, 1550, wird bei den Broten auch ein „panis foraceus“ angeführt. Die vorangegangenen Mitteilungen lassen erkennen, daß es sich hierbei um ein Notbrot gehandelt hatte, welches in „Kriegsleuffen“ unter Verzicht auf Backgeschirr und Backofen gebacken worden war. Auf einem Kupfer des Küchenchefs Bartholomeo Scappi, Mundkoch bei Papst Pius V., ist auf einem Bratspieß ein derartiges Gebäck deutlich zu erkennen. Noch im vorigen Jahrhundert wurde dieses Brot vereinzelt gebacken, wie die Dichterin Gwen Bristow in Kalifornien festsellen konnte. Auf den Trecks der Kaufleute wurden diese Brote um eiserne Brotstöcke gewickelt, über glühendem Büffeldung gebacken und noch warm zum gebratenen Fleisch oder Kaffee verzehrt. Mitunter wurden sogar die Ladestöcke der Gewehre als Backspieß benutzt. Die Kenntnis dieser Backmethode ist sehr wahrscheinlich von Missionaren der Franziskaner dort verbreitet worden. Diese hatten, 1823 beginnend, an der Westküste Kaliforniens in Abständen einer Tagesreise Stationen angelegt. II. Obgleich sich in der Vergangenheit der Backkunst die Begriffe „Brot“ und „Kuchen“ oft sehr schwer eindeutig trennen lassen, kann die II. Generation der Baumkuchenfamilie zweifellos als Kuchen angesprochen werden. In einer Handschrift aus der Zeit um 1450 ist neben anderen, vorzüglichen Kochrezepten folgendes zu lesen: „Von essen eins kuchen an eine spiß. Wiltu machen einen kuchen an eyne spiß von haydenischen Tayg so berayt jn wol von zwayerley oder drayerley varbe Vnd leg sie neben ein ander nach ds lang daß ye sind daß andere nicht kurze Vn besneid dann den einen teyl mit eine messer an eyne ort Vn wint daß vmb einen hultzen spiß Vnd beslah es mit eyr tattern an den orten so belabt er dir gatz Vn prat In nicht zu heyß.“ Was unter einem „Heidenischen oder Bohemischen“ Teig bzw. Kuchen verstanden wurde, ist aus der um noch 100 Jahre älteren Würzburger Pergamenthandschrift ersichtlich. Danach wurden dem Teig Honig, Eier, Pfeffer, „würtze“ und Mandeln beigefügt. Farbige Teige waren damals sehr beliebt, und es werden entsprechende Anweisungen für die Färbung angegeben. Saffran für Gelb, Spinatsaft für Grün, Kornblumensaft für Blau (blaw) und andere mehr. Der eben beschriebene wurde also um einen hölzernen Spieß gewunden, mit Eierdottern eingestrichen und nicht zu heiß gebraten. Das Bakken derartiger Kuchen ist tatsächlich eher dem Braten ähnlich als einem Backen, wie die Durchführung der entsprechenden Backstudien vor Augen geführt hatte. Von den Klosterküchen aus hatte dieser Spießkuchen Eingang in die Herrschaftsund später in Bürgerküchen gefunden. Nach 1500 werden die Rezeptfunde immer zahlreicher und die Würzung feiner. Oftmals ist Saffran, daneben Muskatblüte und später Zimt angegeben. Bemerkenswert ist aber die häufiger vorkommende Forderung, getrocknete Weinbeerlein, also Korinthen, in den Teig einzustreuen. Diese Generation der Spießkuchen hatte weite Verbreitung gefunden. 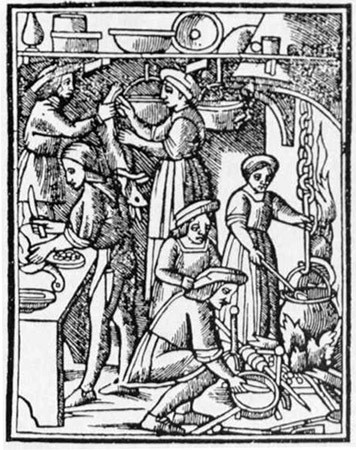 In dem italienischen Kochbuch „Epulario“, Venedig 1526, ist sogar eine Abbildung vorhanden, wie ein solcher Kuchen gebacken wird. Eine Frau dreht den Spieß, während ein Koch mit einer Gänsefeder den Kuchen mit Fett bestreicht. In St. Joachimsthal (Böhmen) erregte das Backen der Spießkuchen sogar den ärger der Kirche. Der große Prediger Matthesius, ein Freund Martin Luthers, schreibt in seinem hinterlassenen Buch „Syrach“ 1554: „...vnd gehet der mann forne naus / so gehet sie hinten naus / zum Krahles / für die Wochen / zum Spießkuchen / sauffen einander ein Pletzsch Bier zu...“ In der damals drittgrößten Stadt Deutschlands gingen demnach die Frauen der Silberbergleute bereits unter der Woche in die Schänke, aßen Spießkuchen und tranken Bier (!) dazu. Was sonst noch in den 308 Predigten zu lesen ist, wurde tatsächlich bereits 1554 geschrieben und nicht erst 1964! Diese II. Baumkuchengeneration ist bis Anfang dieses Jahrhunderts in Österreich nachweisbar und noch heute in verfeinerter Qualität in Ungarn als „Kürtös Kalàcs“ und in Siebenbürgen als „Baumstritzel“ oder „Schornstein-Kolatschen“ ein bevorzugtes Hochzeitsgebäck. III. Eine rationellere Herstellungsweise tritt uns in der III. Baumkuchengeneration entgegen. Das älteste ausführliche Rezept dafür begegnet uns bereits 1547 bei Balthassar Staindl von Dillingen. Wie ersichtlich, wird heirbei der Teig zu einem Rechteck ausgerollt und als Fläche um den „spiß / der muß darzu gemacht sein...“ gelegt und in Abständen mit Faden gebunden. Nach dem Bestreichen mit gesalzenem „Ayer dotter“ wird er wie bei den vorhergehenden am offenen Feuer gebraten. Während dieses Backens wird er natürlich mehrfach mit Schmalz „gesalbt“. Marx Rumpolt in Frankfurt (Main) beschreibt diese gleiche Generation in beiden Ausgaben seines vorzüglichen Kochbuches 1581 und 1604. Joh. Christoph Thiemen hat in seinem 1682 erstmals in Nürnberg erschienenen „Haus-, Feld-, Artzney-, Koch-, Kunst- und Wunder-Buch“ für diese Kuchen neben Spießkuchen den Namen „Böhmische Kuchlein“. IV. Während bisher nur Teige für diese Spießkuchen angefertigt wurden, änderte sich dieses nach dem 30jährigen Krieg. Die bisher mehr landschaftlich gebundenen Back- und Kochrezepte waren durch die Umwälzungen im Land zur Kenntnis der Frauen in andere Gebiete gelangt. Dazu kam, daß durch die Türkenkriege der Kaffeegenuß in Europa bekanntgeworden war, ein Umstand, der entscheidend zur Kultivierung der Lebensart beigetragen hatte. Welche Vielseitigkeit die feinen Gebäcke damals aufwiesen, hatte die in Kiel lebende Professorengattin Maria Sophia Schellhammerin getreulich aufgezeichnet. In ihrem 1692 als „Braunschweigisches“ und später mit gleichem Text in Berlin gedruckten „Brandenburgischen Kochbuch“ beschreibt sie allein 4 rezepte der Baumkuchenfamilie. Es sind da ein Rezept der II. Generation, ein Rezept der III. Generation und zwei Rezepte der IV. Generation angegeben. Hierbei wird nun also eine Masse bereitet, nach Art der küchenmäßigen Eierkuchenteige. Bei diesen Rezepten waren die Backstudien besonders aufschlußreich. Es ergab sich bei deren Durchführung, daß es mit diesen Massen durchaus nicht so einfach war, „Zakken“ zu bekommen. Der Geschmack dieser Kuchen war ausgezeichnet, der Sättigungsgrad allerdings überraschend hoch. Diese Kuchenart muß schon vor 1700 weit verbreitet gewesen sein. Rezepturen sind mehrfach bekanntgegeben worden. Besonders eingehend beschreiben alle um und nach 1700 in Nürnberg erschienenen Kochbücher die verschiedensten Variationen. Der tüchtige fürstbischöfliche Mundkoch zu Salzburg, Conrad Hagger, führt allein 5 verschiedene Rezepte an und fügt sogar eine Abbildung bei. Den Massen wurden nun auch kräftigere Gewürze und oft geriebene Haselnüsse beigefügt Um leichter Zacken zu bekommen, wurden die Kuchen während des Backens mit Mandelstiften oder Zitronatstäbchen gespickt. Nach dem Backen war oftmals ein „Eyß“, eine Glasur aus gestoßenem Zucker, Eiklar und Pomeranzenblütenwasser vorgeschrieben, womit die Zacken „bedupft“ werden sollten. Wir finden Anweisungen, daß nach dem Aufstellen auf der Tafel ein Strauß frischer Blumen in die Öffnung eingesteckt und die Platte mit kleinem Gebäck „zierlich“ umlegt werden sollte. Bei zahlreichen Rezepten der IV. Generation bestand die Anweisung, das Eigelb in die Sahnemasse einzurühren und das Eiklar zu Schnee zu schlagen. Wohl wurde eine wesentlich bessere Backfähigkeit der Masse erreicht, aber durch die große Menge der Sahne konnte die heute beim Baumkuchen erwünschte Zartheit noch nicht erreicht werden. V. Der genaue Zeitpunkt des Übergangs von der IV. zur V. Generation konnte bisher trotz aller Mühe noch nicht ermittelt werden. Erst um die Mitte des 18. Jahrhunderts brachte die Ausweitung des Überseehandels die Möglichkeit mit sich, weitere Verbesserungen bei der Gebäckherstellung zu erarbeiten. Der Zucker, bis dahin überaus teuer, konnte reichlicher Verwendung finden und wurde gleichzeitig weiteren Bevölkerungsschichten erschwinglich. Wir können uns heute kaum vorstellen, mit welcher Begeisterung in Backstuben und Küchen dieser weiße Reichtum aufgenommen wurde. Nun ging es ans probieren, geheimhalten, flüsternd, im Vertrauen nur der allerbesten Freundin verratend – „Eier und Zucker rühren, eine ganze Stunde lang, aber um alles in der Welt nur ein einer Richtung, sonst mißlingts.“ So oder ähnlich muß es umgegangen sein, nachdem erst einmal erkannt war, daß Zucker und Eier, auch Butter und Zucker sich zu einer Masse verbinden ließen, wie sie bisher noch nie gelungen war. Die nun fachmännisch bereiteten Massen buken völlig anders, als bisher bekannt, sie buken schneller, und vor allen Dingen waren die Gebäcke viel, viel zarter. Jahrzehnte wurde über dieses Verfahren nichts gedruckt. Erst 1769 konnte bei Marcus Looft in der 7. Auflage seines Niedersächsischen Kochbuches neben 2 Rezepten der IV. Generation das erste der V. Generation gefunden werden. Aber bereits 1774 wurden ähnliche Rezepte in zwei verschiedenen Werken in Berlin veröffentlicht. 1796 wurden erstklassige Baumkuchenrezepte in Ulm bekanntgemacht, bald darauf auch in Thüringen. Nun war es sehr aufschlußreich, die gefundenen Rezepturen chronologisch auf Tabellen einzutragen und die fortschreitende Verfeinerung zu beobachten. Leider sind diese Blätter zu umfangreich geworden, um auch nur einen Teil hier wiedergeben zu können. Noch einmal rückschauend über Entwicklung und Verbreitung ergibt sich die erstaunliche Tatsache, daß der Weg der Baumkuchenfamilie von Griechenland über Rom zum südlichsten Teil des Limes gung und sich dann die Donau aufwärts fächerförmig im deutschen Sprachgebiet verbreitete, wobei sich auch die Qualität vollendet hat. Dem Fachmann brennt natürlich schon lange die Frage auf der Zunge, seit wann nun der Baumkuchen berufsmäßig gebacken wird. Jedenfalls ist der Baumkuchen bereits in der II. Generation unliebsam aufgefallen, wie eine Nürnberger Polizeiverordnung von 1485 beweist. Zu Hochzeiten wurde darin die Personenzahl beschränkt, welche zum „ayrkuchen“ geladen werden durfte. In Frankfurt (Main) dagegen wurde dieser Kuchen am ersten der drei Hochzeitstage zum „Undergelag“ um 3 Uhr nachmittags aufgetragen. Er war mit „schönen Blumen und anderem Gewächs, von Wachs gemacht, geschmückt“. Jeder der Festgäste erhielt ein Stück dieses Kuchens, um es seinen Kindern mitzubringen. Ein Hochzeitsbrauch, wie er in anderem Zusammenhang bis in die jüngste Zeit erhalten geblieben ist. Diese Sitte wurde aber auch dort, bei den prachtliebenden Patriziern der Gesellschaft von Hohen-Limpurg 1576 als ein „Ohnnützer Ohnkost“ abgeschafft. Aus einer Rechnung der Fasnacht 1525 dieser Gesellschaft ist ersichtlich, daß „Eyerkuchen“ in die Küche geliefert wurden und 7 Stück davon 3 Groschen 5 Pfennige (Silbergeld) gekostet hatten. Von den Festessen der Leipziger Professoren sind genaue Abrechnungen erhalten geblieben. Bereits seit 1648 wurden dazu auch Spießkuchen gekauft, welche sich großer Beliebtheit erfreuten. 1704 und 1709 waren sie teuer, es kostete eine „Röhre“ acht gute Groschen, während in den anderen Jahren nur sechs gute Groschen bezahlt werden mußten. Meistens wurden drei Stück gekauft. Obwohl jeder gute Koch diese Spezialität bereiten konnte hatten sich offensichtlich damals bereits besonders begabte Fachleute darauf spezialisiert. Im Band XII der „Handwerke und Künste“, Berlin 1774, wird der Baumkuchen als „zur Stadtarbeit der Conditoren gehörig“ ausgewiesen. Ein überaus lebendiges Bild der Tafelfreuden stellt die Arbeit von Germershausen, Leipzig 1779, dar. In Form eines Gespräches zwischen einer eingesessenen Hausfrau und einer „durch Krieg reich gewordenen“ jüngeren Frau wird besprochen, was sich zu einem Hochzeitsessen „schickt“. Nun, bei diesem dort besprochenen Essen hatte sich der angebotene Baum- oder Stangenkuchen nicht „gereimet“. Die Güte desselben allerdings wurde als ganz vorzüglich gepriesen, „obgleich die gelieferten Baumkuchen vielmals nicht die besten waren“. Der Konditor X aus der Stadt hatte ihn geliefert, und damit wußten alle Damen, daß sie keinen schlechten Baumkuchen essen würden. Nach den Freiheitskriegen wurde dem Baumkuchen erneut besondere Aufmerksamkeit geschenkt. In Cottbus buk eine Frau W. Kluge geb. Groch seit 1819 auf der Promenade Baumkuchen „Zum Versand und Kleinverkauf“. Dieser Betrieb wurde 1886 Kaiserl. Hoflieferant. In Berlin war es um die gleiche Zeit der aus der Schweiz zugewanderte Konditor Reibedanz, Französische Straße. Sein künstlerisches Ladenschild, heute im Märkischen Museum, zeigt u. a. einen mit Makronenschnörkeln garnierten Baumkuchen, welcher als oberen Abschluß einen „Blattlstock“ und eine Enzianblüte trägt. Zwischen 1825 und 1830 begann in Salzwedel Frl. Louise Lentz, geb 1803, nach einem Rezept ihres Großvaters Ernst August Garves Baumkuchen zu backen. Beim Markgrafen zu Schwedt, dem Schwager Friedrichs II., war Garves lange Zeit Küchenmeister gewesen und ging später nach Berlin an den Hof Friedrich Wilhelms II. Dort blieb er aber nicht lange, und er übernahm Anfang 1793 in Salzwedel die Bewirtschaftung des Neustädter Ratskellers, dem heutigen „Schwarzen Adler“. Der verstorbene Kollege Stappenbeck in Salzwedel hatte mit größter Sorgfalt alles erreichbare Archivmaterial durchgesehen, so daß die so oft und heiß diskutierte Streitfrage über die Priorität der Baumkuchenbäckerei mit gutem Gewissen zu den Akten gelegt werden kann. In der Geschichte der Salzwedeler Baumkuchen sind die mehrfachen Königsbesuche entscheidend für deren spätere Berühmtheit geworden. Selbst Bismarck hat in Salzwedel Baumkuchen gegessen. Vereinzelt finden sich auch in der schöngeistigen Literatur Mittellungen über die Beliebtheit des Baumkuchens. Höfler bemerkte dazu unterm Jahr 1829, daß Felix Mendelssohn-Bartholdy den Baumkuchen besonders liebte. Der Dichter Theodor Fontane schreibt mit Wehmut in seinem Werk „Meine Kinderjahre“, wie zur „Großen Gesellschaft“ Baumkuchen gebacken wurde. Eine renommierte Kochfrau schuf jedesmal dieses Wunderwerk. Fontane vergißt nicht deren Namen, Witwe Gaster, zu erwähnen, welcher um 1830 die Swinemünder Hausfrauen ein Fest gaben, nachdem sie ihren 1000. Baumkuchen gebacken hatte. Aber die Baumkuchen der damaligen Zeit müssen noch recht stabil gewesen sein, wenn Fontane 1894 klagt, daß die jüngere, feinere Qualität „Entartungen, schwächliche, schwammartige Bleichenwangs“ seien. Anders dagegen Graf Lanckoronsky, welcher in seinen Memoiren mit Begeisterung erzählt, wie seine Mutter seit 1884 in Groß-Lagewniek/Oberschlesien zu Vaters Geburtstag Baumkuchen gebacken hatte und uns heute bedauert, daß wir die feine Qualität nie mehr kennen lernen würden. Die Tochter Knut Hamsuns, Ellinor, war ebenfalls eine geradezu leidenschaftliche Baumkuchenesserin. Böse Zungen behaupten sogar, daß sie nach einem gargantuischen Mahl zum Konditor Heyl am Olivaer Platz in Berlin gegangen sei und dort noch einen ganzen Baumkuchen verzehrt hätte. Über die Gewohnheit in Berliner Familien, zur Hochzeit einen Baumkuchen zu haben, selbst wenn sie nicht wohlhabend waren, berichtet Saß in seiner aufschlußreichen soziologischen Studie 1846. Dennoch wurde der Baumkuchen zum festen Bestandteil der Konditorenarbeit. Zu den Meisterprüfungsarbeiten, welche 1854 der Gewerberat in Berlin vorgeschrieben hatte, gehörte unter vielem anderen „ein Baumkuchen mit einem dazugehörigen eßbaren Aufsatz“. Wenn auch heute noch in einzelnen Hotelküchen Baumkuchen gebacken werden, so ist dieses zur Ausnahme geworden. Krackhart gibt in seinem Conditoreibuch 1870 noch keine speziellen Baumkuchen typen an. In dem wunderbaren Conditorei-Lexikon von Otto Bierbaum 1898 werden dagegen Rezepte für „Berliner“ und „Magdeburger“ angeführt. Bei „Salzwedeler“ wird auf das Rezept „Berliner I“ verwiesen, ohne daß dieses die uns heute geläufigen Merkmale des Salzwedeler Typs aufweist. Die einzelnen Baumkuchentypen können sich demnach erst nach der Jahrhundertwende herausgebildet haben. Heute besteht noch keine einheitliche Auffassung unter den Fachleuten, wie die Abgrenzung der einzelnen Typen nach ihren besonderen Merkmalen erfolgen könnte. Die große Zahl der öffentlich bekannten Rezepturen und der weit über 30 Möglichkeiten der Massebereitung lassen kaum hoffen, entsprechende Vereinbarungen erreichen zu können. Aber wie bei allen Faktoren in der Wirtschaft, der Erfolg entscheidet. Der Käufer ist ein unbestechlicher Richter. Nur dort, wo Qualität und die feine Würzung liebevoll gepflegt werden, ist der Baumkuchen immer noch der König und wird es bleiben. Noch vieles müßte berichtet werden, wenn die Baumkuchengeschichte vollständig sein sollte. Einige kurze Ergänzungen seien noch gestattet. Von den Künstlern des vorigen Jahrhunderts hatten sich einige den Baumkuchen als schmückendes Beiwerk bei ihren Darstellungen gewählt. Hier sei nur an Theodor Hosemann erinnert, welcher die künstlerischen Speisekarten für die Galatafeln des Prinzen Albrecht von Preußen gezeichnet und dabei mehrfach Baumkuchen überaus humoristisch dargestellt hatte. In Steiermark und in Kärnten wird noch vereinzelt die IV. Generation von Hausfrauen zu Familienfesten gebacken, während dieser Brauch in Tirol bereits untergegangen ist. Dagegen bäckt in Röschitz bei Eggenburg-Niederösterreich eine Frau den „Prügel“ gewerbsmäßig, welcher nach dem gleichen Rezept und mit dem gleichen Dekor in Südschweden als „Spettekaka“, zusätzlich mit einer Krone aus Eiweißspritzguß geziert, an Festtagen auf die Tafel kommt. 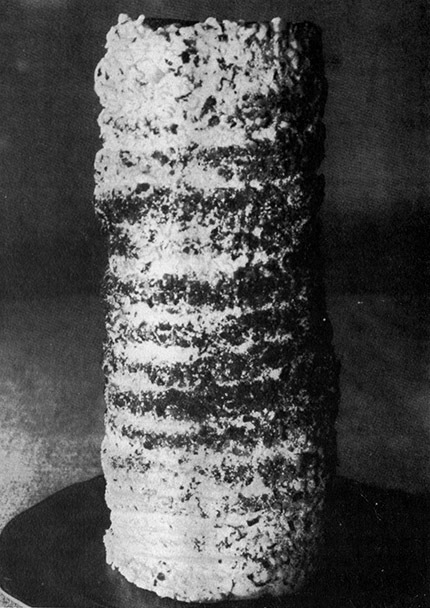 Von den Riesenbaumkuchen, welche um die Jahrhundertwende gebacken wurden, war wohl der mächtigste der „Tilsiter“ mit 2,40 m Länge. 1905 für die Gewerbeausstellung gebakken, verschlang er 22 Massen zu 1 kg Butter mit insgesamt 1320 Stück Eier. In den letzten drei Jahrzehnten hat der Baumkuchen in vielen Innungssiegeln den Einstigen Bienenkorb verdrängt. Wo heute auf einer Siegelmarke, einem Briefkopf, einer Innungsfahne der Baumkuchen auftaucht, da steht er als Symbol für die Konditorei.